Download game Crusader Kings II: Horse Lords right now! 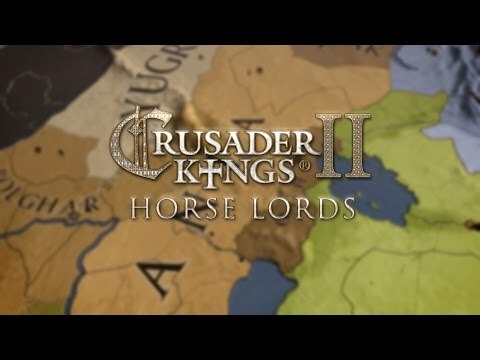 Crusader Kings II: Horse Lords is the ninth expansion for the best-selling strategy RPG Crusader Kings II, and offers expanded gameplay based around the dynamic and vibrant nomadic cultures of the Eurasian steppes. Introducing new systems and game mechanics such as a new government form as well as the possibility of having tributary states, this expansion will also provide you with the opportunity to saddle up and build your empire from horseback. Expanding and controlling trade on the ancient Silk Road in order to finance your conquests is an option - but beware - others will also try to gain control of these lucrative routes, and enemy raiders may try to destroy your trade posts if you don’t guard them well. Can you build a Pax Mongolica and dominate Eurasia, connecting East and West under your rule and creating a new era of prosperity? Or will you be the terrible sword that swats down what others have built, crushing all in your path? The time has come to take the reins of history and become the Great Khan. New Central Asian cultures: Tarim Basin and large parts of Mongolia added to map. Nomadic government available for steppe cultures. These function in a radically different way from sedentary societies - you manage populations instead of holdings, and armies are raised based on population size. Also, the ruler’s power must be balanced against the interests of the various Clans within the realm (Clans are not normal vassals, but rather distinct families and factions within the nomad group). Over a hundred new events add extra color and flair to the Steppes and Central Asia. Non-nomadic rulers will have special options for combating nomads, such as constructing forts in wild enemy lands. The Silk Road, with corresponding dynamic trade mechanics and conflicts. New nomad mercenaries. Send your unruly sons or brothers away as soldiers of fortune. Landless raiding adventurers may appear and harass a region for a time or try to conquer land and settle. New diplomacy option: Tributary States.